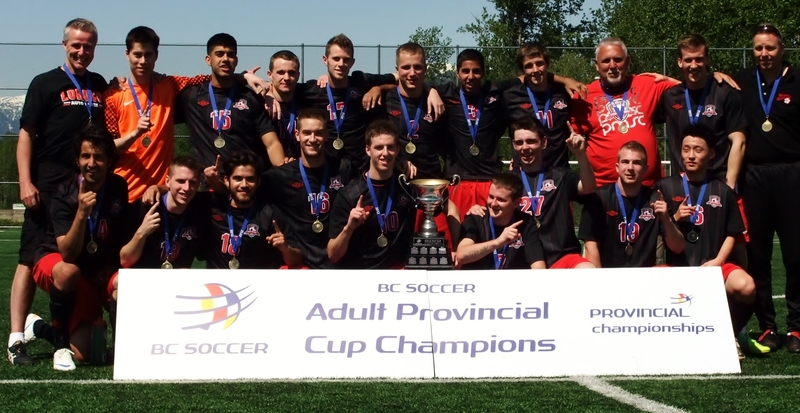 The 2012 BC Provincial Cup finals are all done and dusted, with the winners etching their names in the annals of the competition’s 121 year history. Eight finals (four mens and four womens) were played out at Burnaby Lake West Sports Complex yesterday on a glorious May Saturday for football and in front of good crowd numbers. 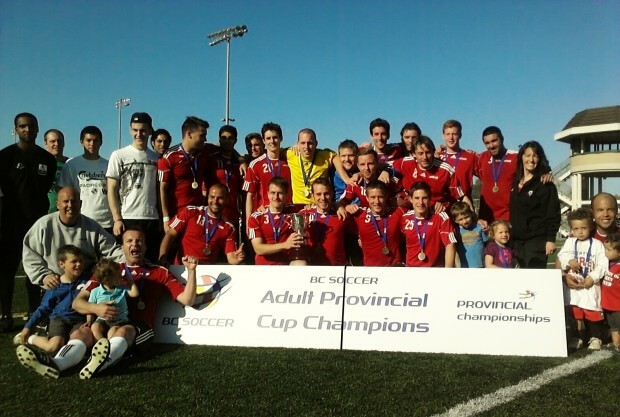 Congratulations go to Surrey United Firefighters on winning the Mens ‘A’ Cup, NVFC Campobasso on winning the ‘B’ Cup, Port Moody Gunners for their U21 Cup triumph and Westside FC on their Masters win. We’ve been following this year’s competition here at AFTN from the first round, undertaking our very own “Road to Wembley Burnaby”. Although the finals we saw weren’t the best matches we’ve seen in this year’s tournament, it was a day of fierce competition, well taken goals and some heated moments, which saw tempers rise along with temperatures. We never made it along in time for the early Masters kick off, but watched the U21 final, the ‘B’ final and, due to a clash of kick off times, the second half of the ‘A’ final. Those three games produced ten goals and three sending offs between them. Not bad entertainment on a sunny Saturday. In the ‘A’ final, Surrey United Firefighters went into the game as favourites and looked to be coasting, but were made to fight every inch of the way in the end by a dogged Delta United Hurricanes side, as they lifted their first Provincial Cup since 2003. Appearing in their third final in the past ten years, Surrey jumped out to a quick start and took the lead in the first ten minutes through ex Whitecap, and Canadian international, Jeff Clarke. They were soon two up from a header and that was how it stayed until the half, which is when we were able to get there to watch! The second half started slowly, but was to burst into life in the later stages of the game. Clarke had a great chance to kill the game off for Surrey as the hour mark approached. A quick break saw him round Drew Smiley in the Delta goal, but he was closed down by a last gasp Delta defender. Clarke did finally put Surrey three up with just under twenty minutes to go, firing home from the edge of the box, and Angus Burke came close to adding to the tally two minutes later, but Smiley made a good save to tip the ball over the bar. To their credit, Delta’s heads didn’t go down and they fought for a way back into the tie. They nearly got it with 15 minutes remaining when Cam Hundal (soon to be playing for the Whitecaps in the PDL) forced a great save out of Paul Shepherd for a corner. They weren’t to be denied though and Steve Millar rose well to head home the resultant corner. Their joy was to last four minutes and it looked like Surrey would finally kill of the game when Surrey’s Shawn Parkes was brought down in the box by Woody Bradford. Clarke stepped up to take the kick but blasted high and over to still give Delta a lifeline. Delta were now looking the more dangerous side and they pulled another goal back with just a couple of minutes of the game remaining. Gary Badesha’s fierce strike from the edge of the box was parried by Shepherd and Bradford was first to pounce and knock it home. It wasn’t to be the end of the action for Bradford, as seconds later he was shown a straight red for a two footed tackle on Brayden Volkenant. Ten man Delta couldn’t find a way through in stoppage time and Surrey held firm to lift the Cup. 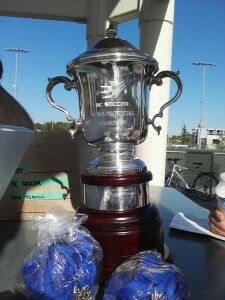 Surrey United now go on to represent BC at the Nationals in Winnipeg in October. The last time they had that honour, in 2003, they came home with the bronze medal. Here’s hoping they can go at least one better this time around and bring home the gold for the first time in their history. They certainly have a very strong side capable of that feat. Our camera battery died by the time we got round to the second half of this game, but you can view the couple of pics we did grab on our phone HERE. The ‘B’ final, for the Keith Millar Cup, didn’t have such late drama, but did provide one of the major talking points of the afternoon. NVFC Campobasso ran out 2-0 winners over Surrey FC Coyotes in a match that saw the Surrey side hit the bar three times in the second half and Campobasso’s star striker, Dever Orgill, sent off in an amazing flare up at a throw in. It was a fairly even start to the match, with Surrey having the first attempt on goal when Adriano Negri fired wide in the sixth minute. Campobasso then came within inches of opening the scoring three minutes later. Former Whitecap Dever Orgill had been Campo’s standout player in their run to the final and one of Surrey’s keys to the game was shutting him down, which they managed to do successfully for most of the match. With nine minutes on the clock he showed them the importance of this. Collecting the ball in the middle of the Surrey half, he had no options, turned back inside and unleashed a fierce low drive from 25 yards that just zipped by the left hand post and sent the keeper’s water bottle flying. Surrey came close themselves in the 17th minute when Nitin Naidu curled a spectacular free kick off the left hand post, which NVFC keeper Riley Janzen may have just got a touch to. The North Van side responded with a rocket from Orgill from the edge of the box, which the Surrey keeper did well to parry away. It was a pretty open match and Janzen produced a fine leg save in the 25th minute after the Coyotes’ Mandeep Sara was put through. Surrey started to turn up the pressure and Janzen was called into action once more to save a Negri shot at his near post, as the Coyotes forced the first of four consecutive corners. With two minutes of the half remaining, Campobasso’s Robson Sa flighted a long free kick into the box, right on top of the Coyotes’ keeper, who managed to tip the ball onto the bar and the danger was cleared. Sara was again put through for Surrey a minute later, but this time pulled his shot wide left. As the game entered first half stoppage time, NVFC got the vital breakthrough. The Coyotes defence ballwatched a Giancarlo Cusano cut back, allowing Kyle Boyes to fire home from 14 yards out for the opening goal. Surrey came close to levelling matters in the 52nd minute when Sara crashed a shot off the crossbar from 12 yards out and the frame of the goal was not to be the Coyote’s friend during the second half. NVFC came within a fraction of doubling their lead midway through the half. Joey Muzzin took a quick free kick to Orgill and the Jamaican’s pace took him past the Surrey defence before a last ditch block took some pace and direction off his shot and sent it agonisingly inches away from the foot of Arran Mofrad and the right hand post. The woodwork came to NVFC’s rescue again in the 72nd minute when a Kule Kambere free kick from the halfway line seemed to bounce untouched off the bar. NVFC got their vital second with fourteen minutes of the match remaining. Muzzin played the ball through to Joshua Sen and the striker’s clinical finish gave the Surrey keeper no chance. Campobasso’s task of seeing their lead through to the end was made a little harder two minutes later when Orgill saw red in more ways than one. Surrey won a throw in on the left and a Coyotes player threw the ball straight at the face of Orgill who was jumping in front of him at the throw. Orgill responded by kicking the ball back at him but missed, which drew a straight red from the ref. As Orgill was set to head off, a racial slur is claimed to have been directed towards him and he ran back onto the pitch and kicked a Surrey player. Hard to condone his actions but even harder to accept the provocation if true. As Surrey tried to push forward for a way back into the game, NVFC nearly caught them on the break but Sa shot wide. As the game moved into stoppage time Chris Kyd became the third Surrey player of the half to see his shot crash of the crossbar. It wasn’t to be the Coyote’s day but the final whistle signalled jubilant scenes on the Campobasso bench, who played some attractive football on this Cup run and showed in the final that they are more than just a one man team. You can view our Flickr photo gallery of the NVFC Campobasso v Surrey FC Coyotes game HERE. The first match we took in on Finals Saturday was the Under 21 final between Port Moody Gunners and defending champions Victoria Highlanders for the Doug Day Cup. Victoria played the better football for most of the match, but were left to rue a string of wasted chances, a missed penalty and a stupid sending off as they went down 2-1 to a quick Port Moody side. Josh Heard had the first real chance of the game in the ninth minute, but a minute later it was Port Moody who were a goal up, when Steven Causier clinically finished a cut back from the byeline. Jason Waller nearly added to the Gunners tally four minutes later when his looping shot was deflected for a corner. The Highlanders should have levelled in the 21st. Farley Cannon crossed to an unmarked Sam Prette from the right, but despite having time and acres of room, he headed wide. Prette seemed to be Victoria’s biggest threat in the match, with some neat passes and getting himself into good scoring positions, but his finishing continually let him down. Victoria were pushing for the equaliser and had two chances during a goalmouth scramble in the 27th minute, which saw Connor McManaman and Cole Ollis have shots blocked before the danger was cleared. Prette had another chance to equalise four minutes later, after being set up by a great passing move, but Port Moody goalkeeper Michael Yip foiled him with a fine leg save. Port Moody came close to doubling their advantage just before the break, but Rab Bruce-Lockheart produced a spectacular one handed save of the match to keep out a curling effort from Gunner 27. Victoria looked the most dangerous team at the start of the second half and their pressure was rewarded with a spot kick on the hour mark. Up stepped Heard, but he hit his kick down the middle and straight into the arms of Yip. Worse was to follow for a frustrated Heard five minutes later. He won a free kick out left after a tackle from Wahid Mojaddidi, and with the Gunner player still on the deck, Heard appeared to stamp on him. The referee had no hesitation in showing a straight red. Mojaddidi is a big centre half and was my ‘man of the match’ for Port Moody. Wouldn’t mind the Caps taking a look at him in PDL action. Port Moody seemed to have comfortably wrapped things up in the 71st minute when Ollis sliced a cross into his own net to give the Gunners a 2-0 lead. The defending champs kept fighting though and as they pushed forward, Port Moody had a couple of half chances to finally kill the game off. The Highlanders couldn’t find a way past a resolute Gunners defence until three minutes into stoppage time when Prette kept the ball at his feet, before finally trundling it into the net at the second time of asking, after Yip had initially saved. It was to be nothing more than a very late consolation and Port Moody edged the game on the day. In the first Mens final of the day, Westside FC beat defending Masters champions West Van FC 1-0, with a first half strike from a tapped on free kick. If you want to see the reports, photos and videos from the earlier rounds, then just click the “Provincial Cup” tag at the end of this article and you’ll be taken to our coverage of the first round, quarter finals and semis. We’ve really enjoyed going to the matches and providing coverage and hope to do it all again next year. So until then, congratulations to all of the winners and enjoy your moment in the sun.